We used shackles with weights to immobilize and prolong the detention of prisoners, criminals, and slaves. 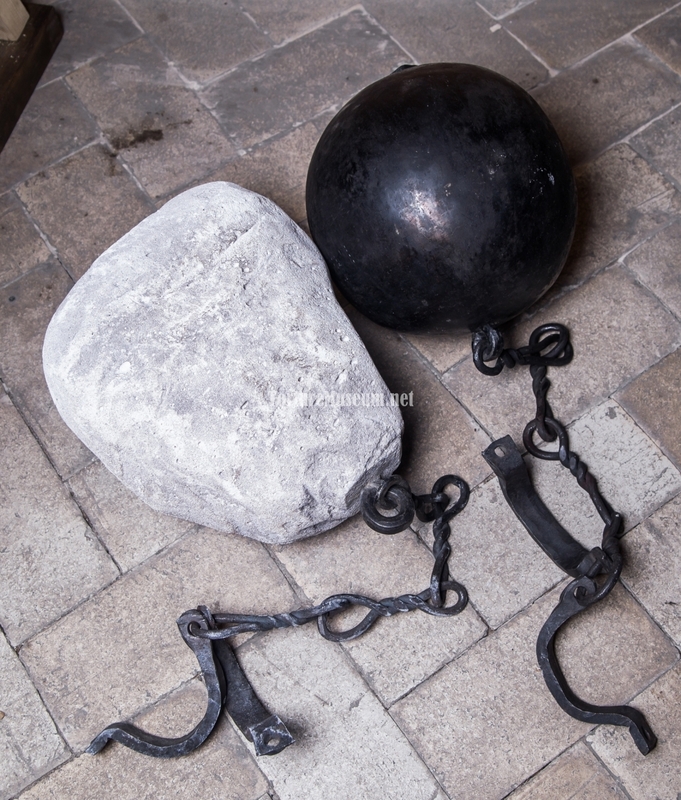 Increase the weight of the chains with the use of metal cores and boulders. Prolonged exposure to such chains substantially limits one’s natural needs, effectively minimizing the ability to move. The very often conclusion was that the prisoner’s limbs would be maimed. There were similar manacles for legs as there were for arms. 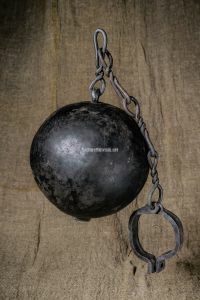 Shackles sometimes reached upwards of 8 kilograms in weight, and the hand piece had a special design which disallowed the prisoner from separating his hands more than thirty centimeters. An interesting fact: In 1866, and American prison wader named John Gardner had an improved model of the shackles patented, called the “Oregon Shoe”. The design was devoid of chains and shackles, instead employing a heavy metal cylinder with a screw and a footrest. The cargo could vary from 3 to 12 kilograms. This model is still used in some penal practices. What do you associate the feeling of guilt with? Might that be a heavy weight? Jailers of the past understood this association quite literally. In order to deprive the dangerous offender of the possibility of escape, his ankles are secured by shackles*. By means of chains connected to said shackles, heavy stones or iron weights are also attached. The locks snap shut, and the life of the one convicted turns into a test, second by painstaking second. In order to take a step, it happens that he must pull a weight equalling a quarter, if not two thirds of his own body mass. During the first few days of imprisonment the jailed man, unaccustomed to such a load, isn’t able to carry out the watchmens’ orders in time. For that he is subjected to ridicule, and deprived of his allotted rations. The loops of the shackles dig into the ankles, causing skin lesions and purulent wounds. These abrasions don’t cauterize due to their constant contact with the rusty iron. 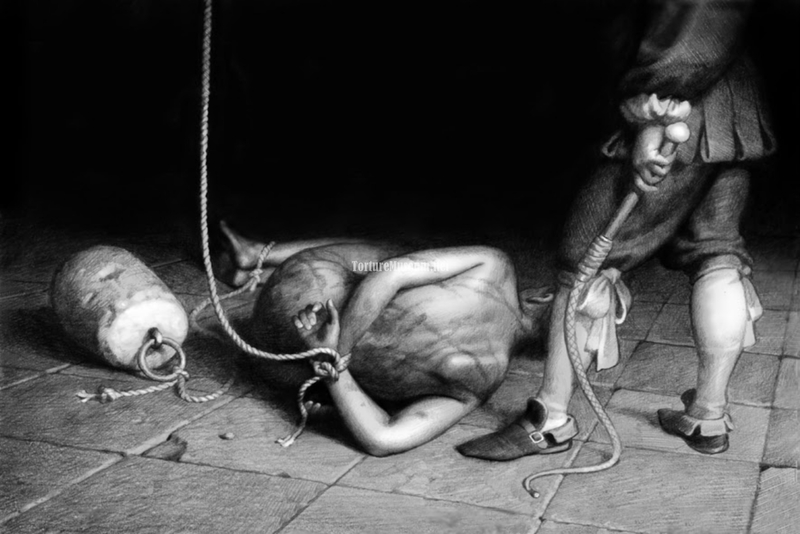 The prisoner takes shreds of fabric torn from his own clothes and places the pieces between the shackles and his skin, but this only helps for a short while. Unrelenting muscle pain drains the body of its strength, and after some time the bones begin to deform. 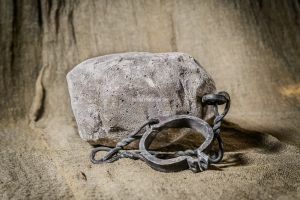 The unceasing ring of chains and the raspy sound of the weight dragging across the stones pursues him both in his dreams and in his reality. He starts to nuerotically twitch after each rustle, and the squeak of a rat echoing out of the dark corners of the chamber sends him into panic attacks. In wearing these shackles in all a mere couple of weeks, a healthy young man transforms into an old man with shamble to his step.